About Us – Midnight Sun Mining Corp. Midnight Sun focuses on the exploration and discovery of world class copper deposits in the prolific Zambian-Congo Copperbelt. 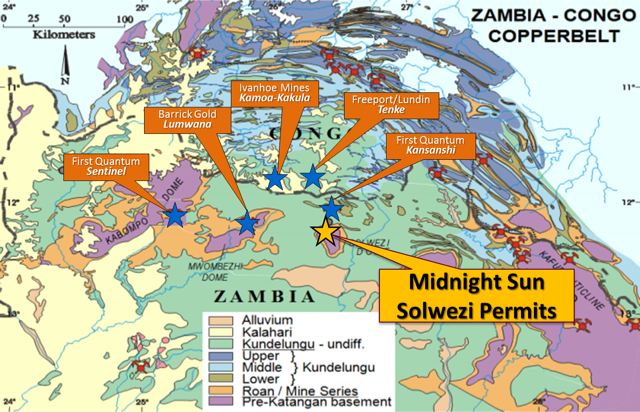 Midnight Sun’s Solwezi mineral exploration licenses in Zambia are located directly adjacent to the largest copper mine in Africa – First Quantum Minerals’ Kansanshi copper/gold mine. The Zambian-Congo copper belt is host to some of the world’s richest mines, with operators that include Barrick, Rio Tinto, Glencore, Ivanhoe Mines, and First Quantum. MIDNIGHT SUN FOCUSES ON THE EXPLORATION AND DISCOVERY OF WORLD CLASS DEPOSITS IN THE PROLIFIC ZAMBIAN-CONGO COPPERBELT.